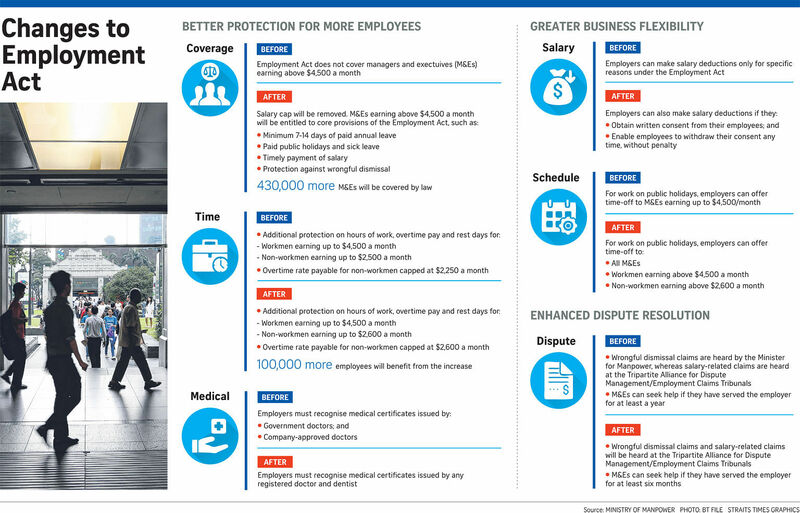 SINGAPORE - The law that protects workers' rights has undergone a major transformation to include all private sector employees, a move that will entitle them to such rights as paid sick leave, mandatory annual leave of seven to 14 days, and protection against wrongful dismissal. This means the Employment Act (EA) will no longer have a salary cap of $4,500 a month. The move is among four categories of major changes Parliament approved on Tuesday (Nov 20) and will take effect in April next year. The others are: giving extra protection to more rank-and-file workers, improving the employment dispute resolution framework and giving employers greater flexibility to, say, compensate staff for working on public holidays. With no salary cap, the Act will cover the growing pool of professionals, managers, executives and technicians (PMETs). But it will not cover public servants, domestic workers and seafarers, who are covered separately under other laws. A major change in the expanded law is protection given to more workers under the section known as Part IV. This section sets out extra protection for rank-and-file workers in such areas as working hours, and payment for overtime work and rest days. For rank-and-file white-collar workers, or non-workmen, the monthly salary threshold was raised from $2,500 to $2,600, a move that brings another 100,000 workers under Part IV protection. But for workmen - manual or blue-collar workers - Part IV protection will continue to cover those earning up to $4,500 a month. Manpower Minister Josephine Teo, in introducing the Employment (Amendment) Bill for debate, said the updates - on which work began in 2012 - were to reflect the changing profile of Singapore's labour force and employment practices. Back in 1968 when the law came into existence, managers and executives were a very small part of the workforce, she noted. "Today, with the proportion of PMETs... expected to make up two-thirds of our local workforce by 2030, it is timely to make a more fundamental change to the coverage of the EA," she said. This was why the salary cap of $4,500 was removed and will benefit an additional 430,000 managers and executives. Mrs Teo also highlighted some changes to the employment dispute resolution framework. For example, salary-related disputes are now handled by the Employment Claims Tribunals (ECT), while wrongful dismissal claims are heard by her ministry. From April, the tribunal will handle both, a move Mrs Teo said will give employees and employers a more convenient one-stop service. Among the changes to give businesses greater flexibility, the Act will offer employers an added option: they can give non-Part IV workers time off for hours worked on a public holiday instead of a full day off or an extra day's pay. The changes were welcomed and supported by all 17 MPs, including two from the Workers' Party, who spoke on them, with many giving ideas on how to further improve it. Labour MP Patrick Tay (West Coast GRC), a champion of the PMETs' cause, called it a "watershed moment" for PMEs earning more than $4,500 a month. "Some rogue employers tried to 'game' the Act by making use of the salary cap to exclude workers from the Act," he said. Some want it to go further and protect vulnerable workers such as the disabled, Baby Boomers and the low-income elderly. Several, like Non-Constituency MP Daniel Goh of the WP, called for the removal of the distinction between white- and blue-collar workers, while a few, like Ms Denise Phua (Jalan Besar GRC), want provisions for the growing number of "gig" workers. Mrs Teo responded with a 40-page reply to the MPs' suggestions while stressing the EA exists to regulate employment practices in a balanced way, and protect workers while retaining labour market flexibility for businesses to thrive and create jobs.